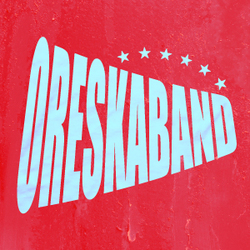 OreSkaBand is an all-female ska band from Sakai, Japan. They have performed in Japan, Canada and the United States, including the Fuji Rock Festival. The band name, "ore ska band," literally translates as "we're (a) ska band." While "ore" is normally considered a masculine pronoun and an informal way to say "I" in Japanese, and the suffix "-tachi" is added to personal nouns when emphasizing that they are plural, in this context the term "ore" means something more along the lines of "we fellows." The choice of "ore" is also one of gender play, as the band usually appear wearing boys' school uniform in their videos and concerts.